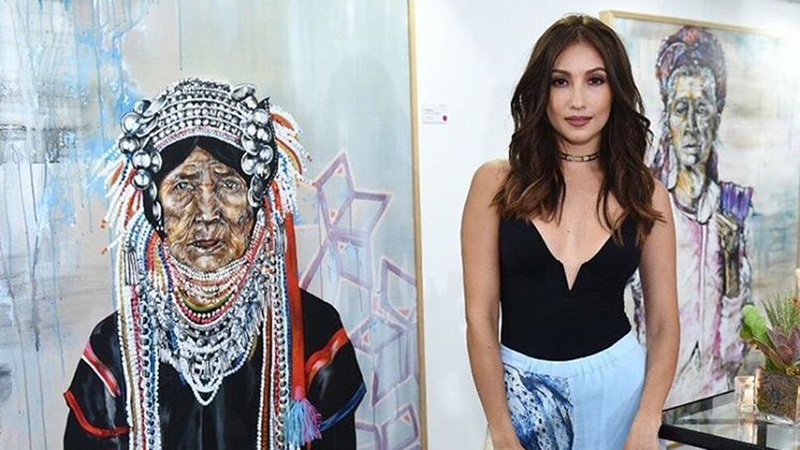 Kalsada is only Solenn Heussaff's second art exhibit and yet she already thinks it'll be a difficult one to top. The gallery couldn't be any more different than her first, both in execution and inspiration. 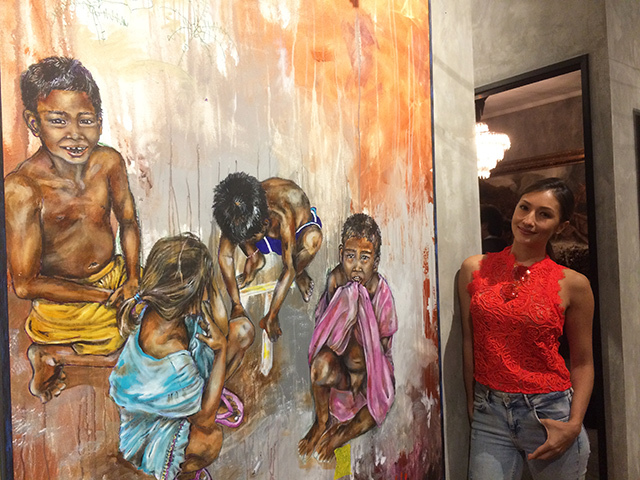 Because while she stuck to her forte of painting people, Solenn wanted to focus on Filipinos this time around. Along with her little nephew Kaeden, she managed to create a raw take on contrasts you have to witness for yourself. 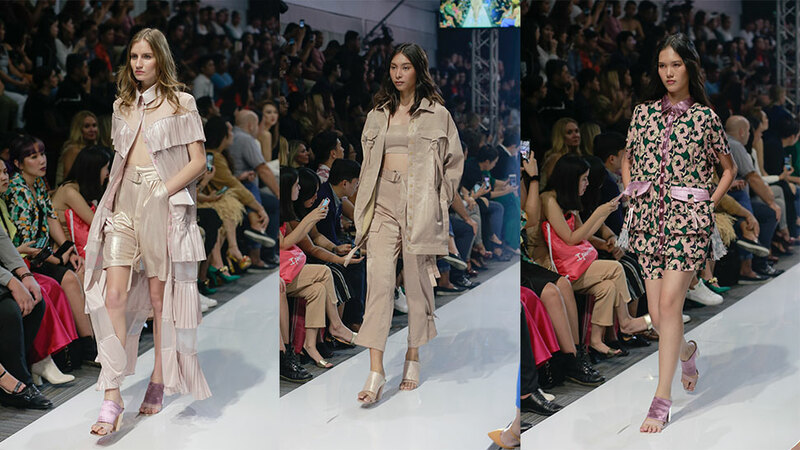 It all started with Solenn's usual musings while stuck in traffic on her way to work.  "I spend most of my time in the car, and every time I look out the window and see people, I always imagine what their life is like," she tells Preview. When she becomes inspired enough by them, she takes their photos to paint later—sometimes through her car window. "It's always been such a passion for me to paint people that have a lot of soul, those who look like they've been through a lot," she explains. 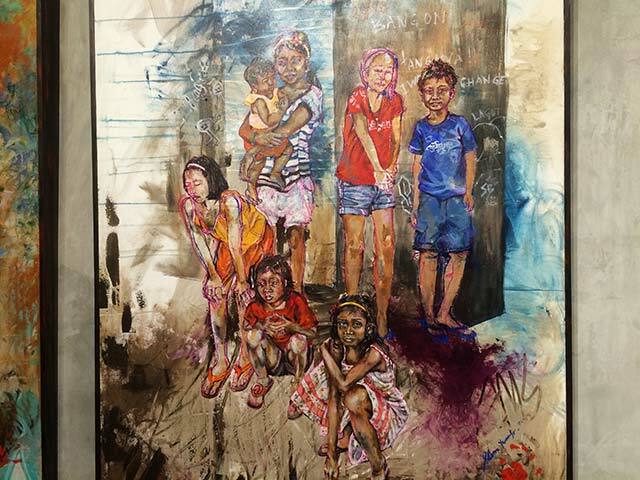 With that, Solenn wanted her art subjects to come from different parts of the country. Some are from right here in the city, others from as far as Northern Samar and Bukidnon. Her friend Bea Constantino also gave her material from a trip to Sulu. "I'm the type of person that when I travel, I like to discover the city by the streets instead of going to the fancy places. There's so much more going on there that it becomes so colorful and authentic," says the artist. Her most memorable trip was the one to Biri in Northern Samar, one she did with Globe which supported her through the entire project. 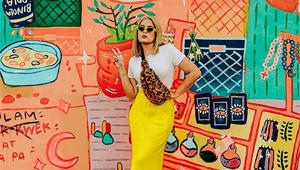 She recalls, "I stayed there for two nights and was able to really connect with the people. There were no tourists so it was just me and them. We went around and I also got to play with the kids. In the paintings, they all have names which are not their real names, but if you look at my video that I posted recently on my website you'll recognize them from the paintings." 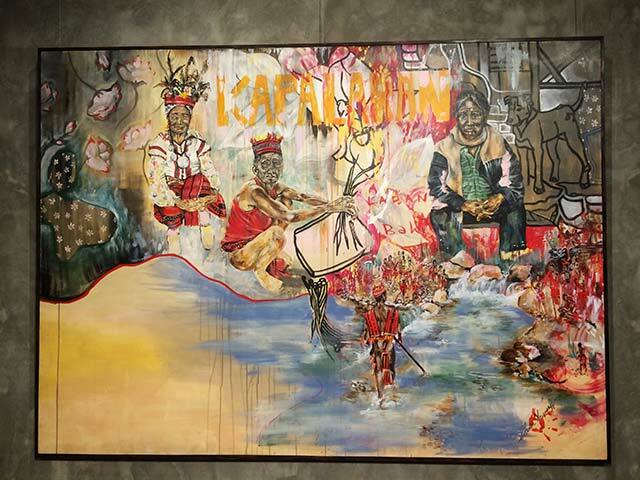 Solenn then revealed that she initially found it difficult to think of a concept for the exhibit. She usually only had Sundays free to paint, which is why it took her a year and a half to complete all the pieces. A finished painting would require 30 to 72 hours on average. Thankfully, her three-year-old nephew Kaeden was there to give her just the inspiration she needed. "I was painting one time and he wanted to paint, too. I gave him paper to do so but he didn't want to touch it, so I gave him a brush instead," she shares. And you can probably tell what happened next. "He splattered paint on what I had painted." At the time, the It girl obviously couldn't help freaking out a little. "Then I was like, you know what, let's just do it. So we did one canvas and I thought it was the best abstract I've ever seen. I painted on top of that and it just worked, and I knew right away what my next exhibit was going to be," she says. From there, the exhibit became a whole collaboration between her and Kaeden. "When he'd be here for a month (Kaeden lives in Singapore) I'd make him do five in a row." He helped her create the backgrounds for the paintings, "I made him run on [the canvas], turn it around, we throw water on it, or he uses his hands. When that's dry, I draw on top." But her nephew's role at the exhibit didn't stop at the random scribbles and handprints. Solenn wanted him to be the lens Kalsada was seen through as well. "I wanted to do this with him because he doesn't see things the same way as I do, especially things that make me sad. Kids are very innocent and they don't really know much about what's going on in the world. They don't know what's good or bad yet, nor do they know what a sad life is. I wanted [the exhibit] to combine sadness and happiness in one environment." 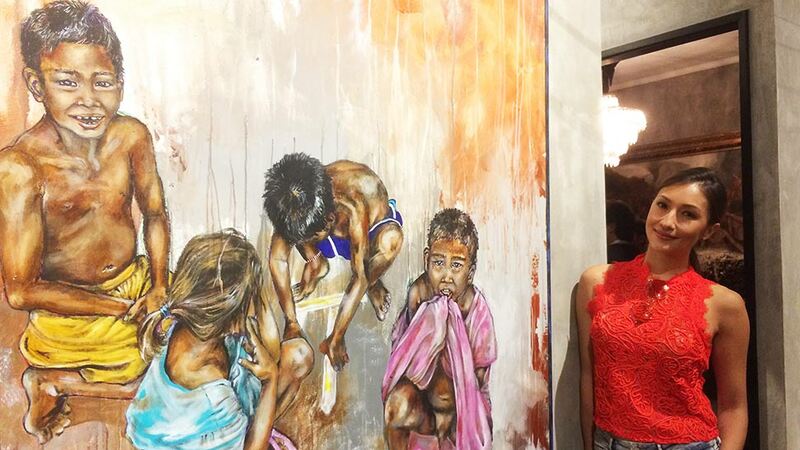 This contrast couldn't be any more obvious from Solenn's paintings. 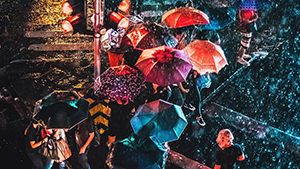 Although everything was painted using bright colors, the subjects were anything but. The sadness in their eyes is almost transparent, their expressions sullen. Only one of her subjects is smiling: a young boy in one of her favorite pieces. She also retold an interesting anecdote to us from when she was framing her paintings. "Someone was there to frame her own work, and she told me 'I love your art, it's very fearless.' And I asked, 'What do you mean by fearless?' She said, 'As a painter you wouldn't actually use those colors, you wouldn't mix them together. 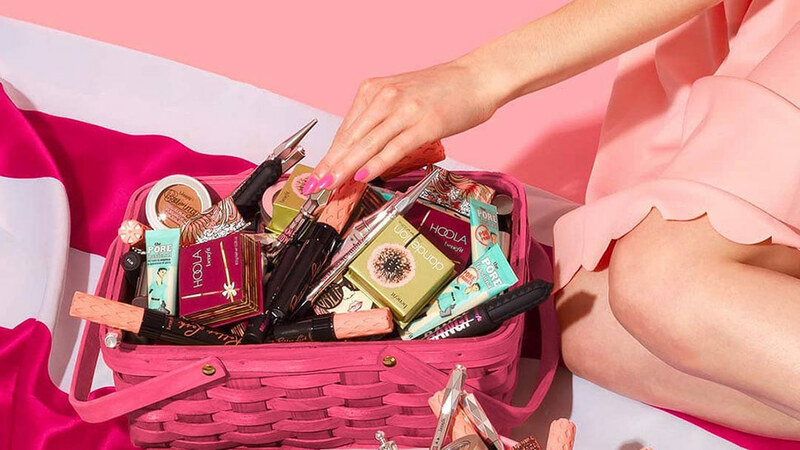 There's just so many things going on and so many colors but it works.'" 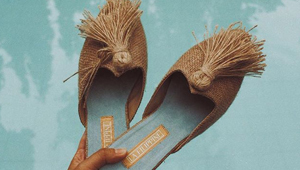 That perhaps solidifed the entire concept for Solenn. "Kids, in life, they don't know things—they just do it. This is what makes the exhibit so innocent and naive but with a really strong message," she says. At the opening night, the Provenance Gallery at Shangri-la at the Fort transformed into a makeshift street party. Taking the concept to heart, they built "posts" and a sari-sari store selling street food-inspired drinks like the Milo Dinosaur but in its Whiskey-fied form. Outside, there was a taho vendor and someone giving out dirty ice cream. The music was ambient, but time and again you'll hear cars honking, kids playing, or a drunkard singing karaoke. 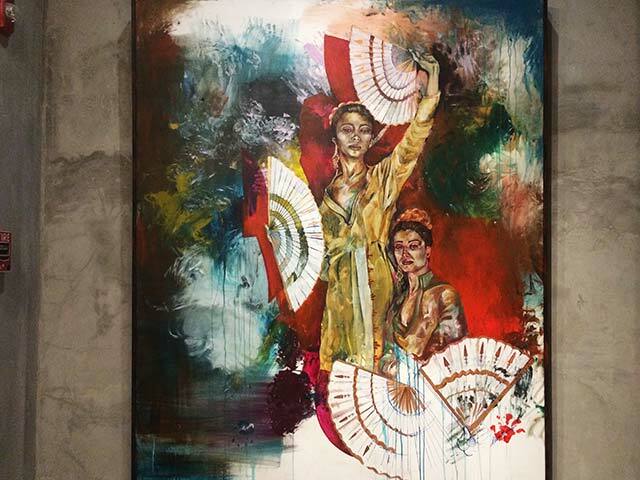 "It was more of an experience than an exhibit," Solenn muses. 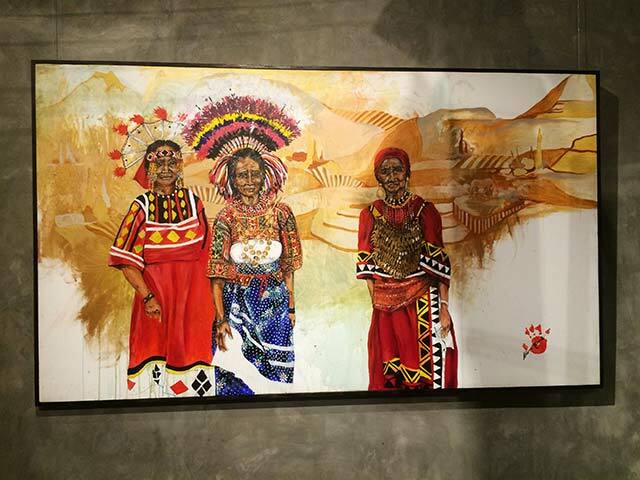 Most of the paintings in Kalsada are up for sale, and 20% of the proceeds will go to the Kalipay Negrense Foundation, a non-profit that supports disadvantaged children. 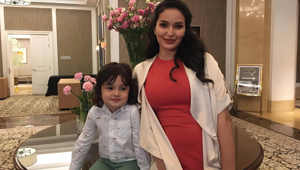 According to Solenn, it's her way of giving back to the kids who inspired her, a way to make the entire thing go full circle. Moreover, she wants this exhibit to encourage the younger generation to visit galleries more often. "You can really learn from art. So many girls have come up to me crying, saying they were touched by the paintings. It feels so nice that you can touch someone by just drawing, so I want this to be something the younger ones can learn from," says the artist. 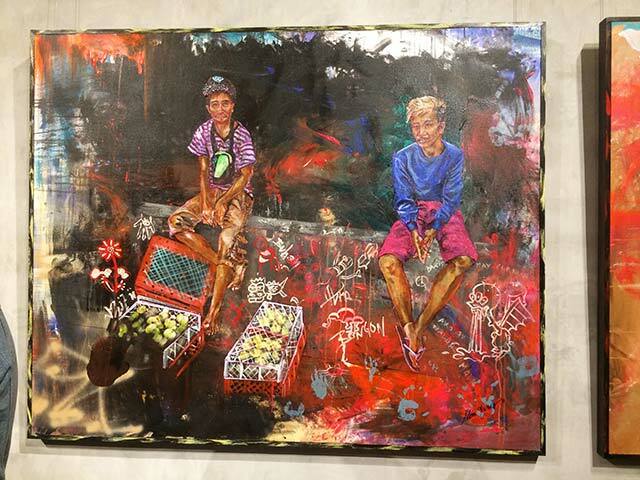 Now you know all this, seeing Solenn's work in the flesh will surely be worth the trip. Granted that there wouldn't be a taho vendor waiting for you at the exit, Kalsada's inspection of reality through a toddler's eyes is the breath of fresh air anyone will love. 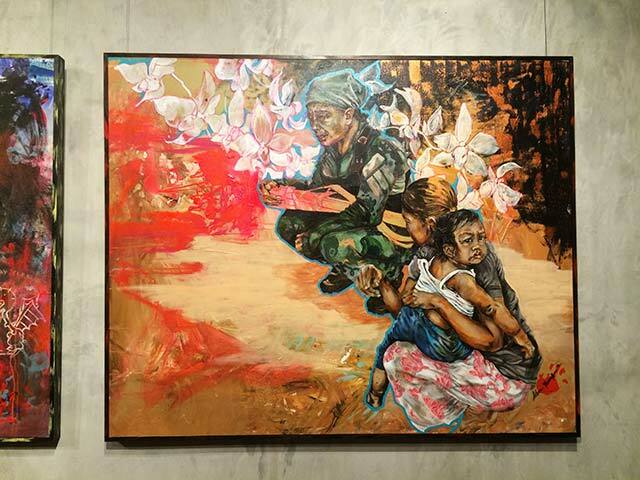 Kalsada will be open to the public at Shangri-la the Fort's Provenance Gallery until November 5. Admission is free.